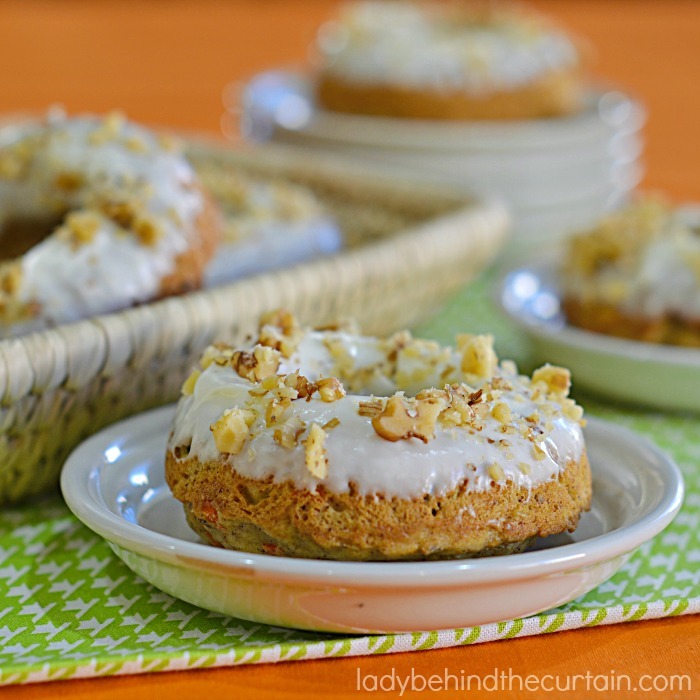 Baked Carrot Cake Donuts | An Easter classic gets a makeover! 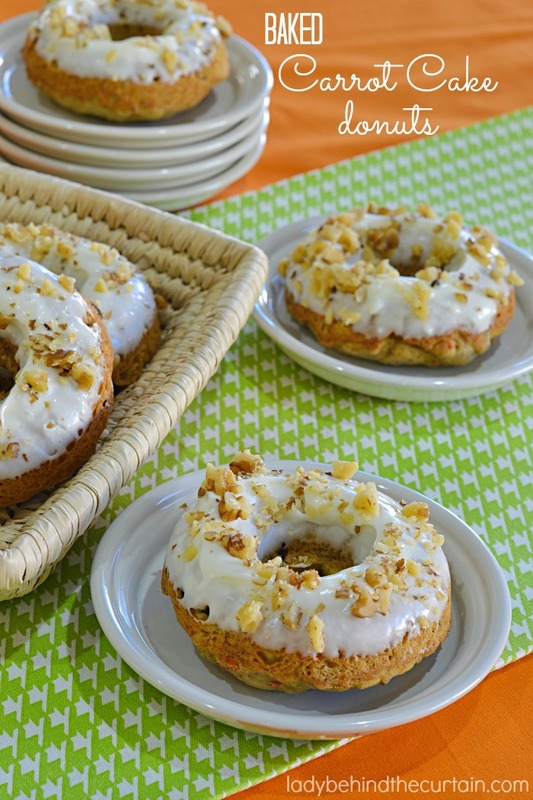 Bring dessert to the breakfast table with these trendy baked donuts! Whether it’s for Easter Brunch, an on the go breakfast or a lunch box surprise you can’t go wrong with these fun Spring donut treats! 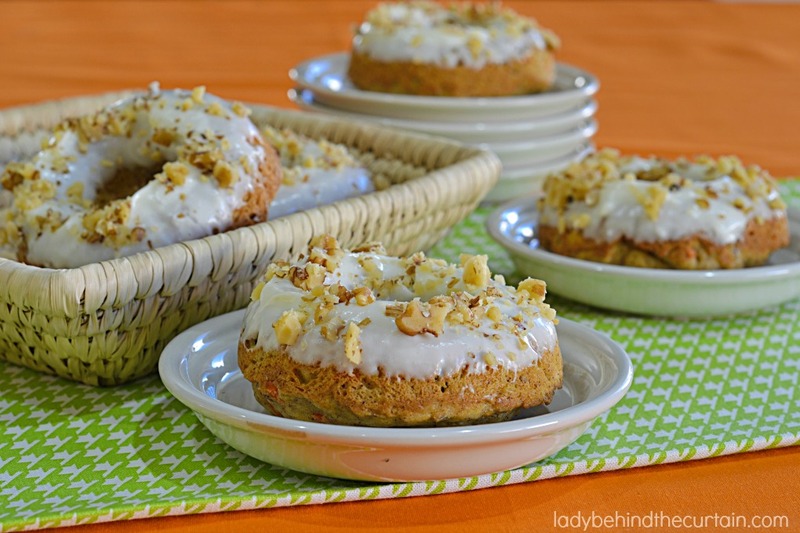 These donuts have everything you love about carrot cake. Freshly grated carrots, raisins, walnuts, spices and possibly the best part of all…..the cream cheese frosting! Maybe it’s your turn to take donuts to the office. How about impressing them with these? Oh yeah….you will totally earn brownie points! Lightly spray with non stick cooking spray TWO 6-cavity donut pans (if you don't have two, just wait and let the pan cool completely before baking the second batch). In a medium bowl, whisk together the flour, baking powder, baking soda, salt, cinnamon , nutmeg and cloves. In a large mixing bowl beat together the butter and brown sugar until light and creamy. Beat in the egg, vanilla and sour cream. Gradually add the flour mixture; mix in the carrots, raisins and walnuts just until combined. Fill each donut cavity HALF full with the batter. Bake 10 to 12 minutes or until a toothpick inserted into the donut comes out clean. Cool 5 minutes in the pan and then transfer to a cooling rack to cool completely. In a small mixing bowl beat together the cream cheese, butter and salt until light and fluffy. Beat in the confectioners' sugar; add the milk and beat until smooth. Dip cooled donuts in the frosting and sprinkle with chopped walnuts.